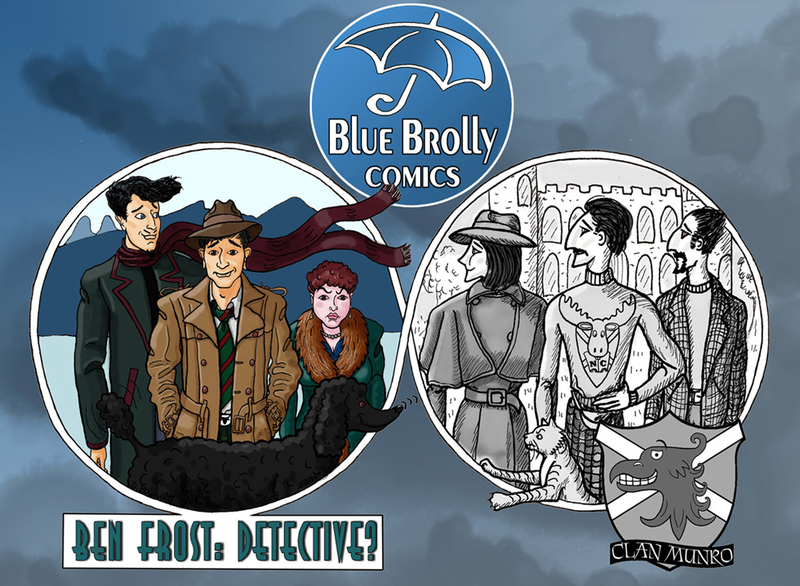 Donna, Laurel and Robyn welcome you to Blue Brolly comics, where you’ll find our full-colour graphic novel — Ben Frost: Detective? 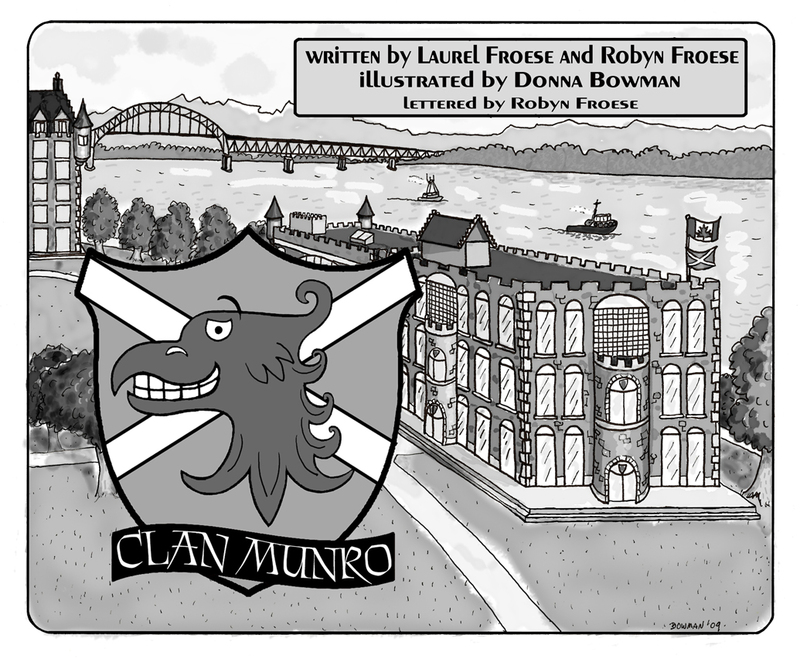 And, in beautiful black and white, our comic strip — Clan Munro. We’ll add a new Ben Frost page and Clan Munro strip every week, along with other fun and useful things, like a blog written by Clan Munro’s furriest character and the graphic life stories of the major Ben Frost characters. You’ll find the latest stuff on … erm … THE LATEST STUFF PAGE. Our test subject (under no coercion whatsoever) found Ben Frost: Detective? and Clan Munro very enjoyable. We hope you like it, too! The CLAN MUNRO HOME PAGE is your gateway to our comic strip, including some vital background information on our setting and characters. The collected strips can be found at CLAN MUNRO 1: WELCOME TO NEWKIRK AND CLAN MUNRO 2: THE JEWELS OF ALBA. 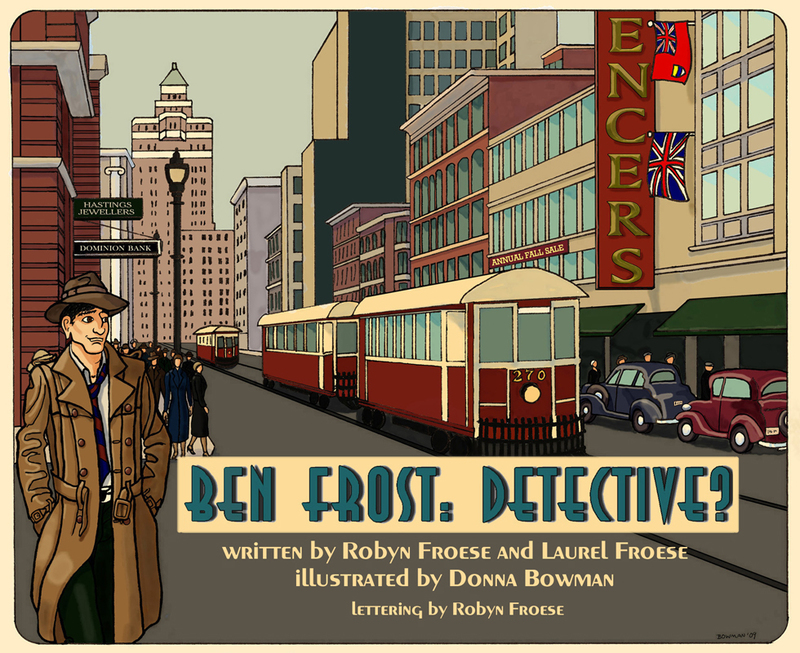 The BEN FROST: DETECTIVE? HOME PAGE introduces you to Ben and his friends and enemies, and his slightly twisted version of 1930s Vancouver. You can see his first adventure on the following two pages: THE QUASI-KIDNAPPING OF KITTY VON KAT: PART 1 and, not surprisingly, THE QUASI-KIDNAPPING OF KITTY VON KAT: PART 2. And you can learn more about all these strange and interesting characters through our exciting PICTORIAL BIOGRAPHIES. © Robyn Froese, Donna Bowman, Laurel Froese and Blue Brolly Comics, 2013-2019. Unauthorized use and/or duplication of these images and text without express and written permission from this blog’s author and/or owner is strictly prohibited. Excerpts and links may be used, provided that full and clear credit is given to Blue Brolly Comics with appropriate and specific direction to the original content.